As you may have heard, some NK refugees recently captured in Laos has apparently been put in Korean custody. That is certainly good news. However there are apparently 12 North Koreans in the custody of authorities in Thailand. Hopefully, the refugees will soon be released to Korean or American officials. Until they are, you may wish to share your concern about their fate with the Thai embassy in Seoul. Here is their email. This page also has their phone and fax numbers. If you contact them, remember to be polite and respectful. I got the letter below from the local chapter of LiNK. Obviously, you should write your own letter, but this can give you some ideas (UPDATE: Spelling errors have been corrected.). I am writing to express my grave concern for the fate of twelve North Korean refugees who are being held at a local jail in your country. As you may know, hundreds of thousands of people have fled severe political persecution in North Korea. Common forms of persecution there include arbitrary arrest, detention, and torture, and the political manipulation of food supplies that uses food as a weapon. Many of these refugees are hiding in China, and others have gone so far as to travel all the way through China and the nations of Southeast Asia in search of refuge. North Korea considers all of these people to be criminals for fleeing this oppression. Those returned to North Korea against their will are certain to face severe conditions in North Korean prison camps. Others will be executed immediately, often publicly. If any of the refugees are pregnant women or women with infants, recent reports from refugees, published in reputable news media, suggest that the children, both born and unborn, will be murdered. Citing some of these concerns, U.N. Special Rapporteur Vitit Muntarbhorn recently deemed the North Koreans to be "refugees sur place" and opined that involuntarily repatriating them to North Korea would violate the 1951 U.N. Refugee Convention and its 1969 Protocol. I urge your government to immediately release these twelve people, all of whom are legally citizens of the Republic of Korea under Articles 2 and 3 of the Republic of Korea Constitution, and grant them safe passage to the Embassy of the Republic of Korea in Thailand. If the Republic of Korea Embassy refuses to meet its constitutional and international obligations to accept all twelve of these refugees, I am confident that the U.S. Embassy in Thailand will do so pursuant to the North Korean Human Rights Act of 2004, which requires U.S. embassies to allow North Korean refugees to present applications for political asylum. U.S. consular facilities in Southeast Asia are complying with these legal requirements, in part because the human rights of North Koreans are a matter of great concern to the American people. We thank you in advance for the use of your good offices to save the lives of these innocents. Any adverse reaction by the North Korean government will be fleeting. It is the gratitude of the Korean and American peoples that will endure. Thank you. I was going to wait for a final update on Project Sunshine on LiNK's blog before I posted these pictures, but I might as well get them up. They were from a small protest on May 31. From what I have been able to gather, the LiNK lectures and symposiums were successful and the street actions a little less so. I also heard that there was a bit of nastiness at one lecture when some pro-Kim Jong-il students raided it (I certainly hope to hear more on that. 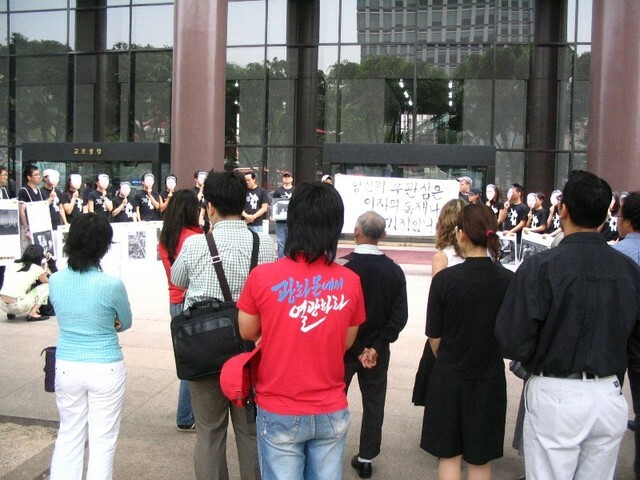 LiNK's May 31 protest in Seoul drew about 80-120 onlookers. 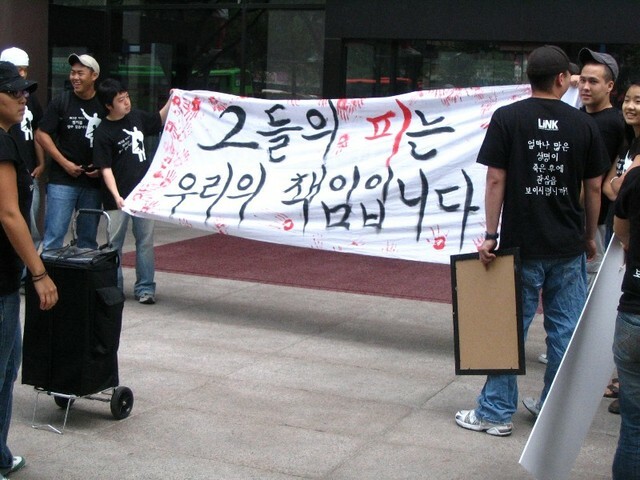 This banner roughly says "Their blood our responsibility is." In other words "Their blood is on our hands." I had to look up 책임 in my dictionary. Nice street theater. They put on the KJI faces to demonstrate our culpability for what is happening to North Koreans if we choose to do nothing. 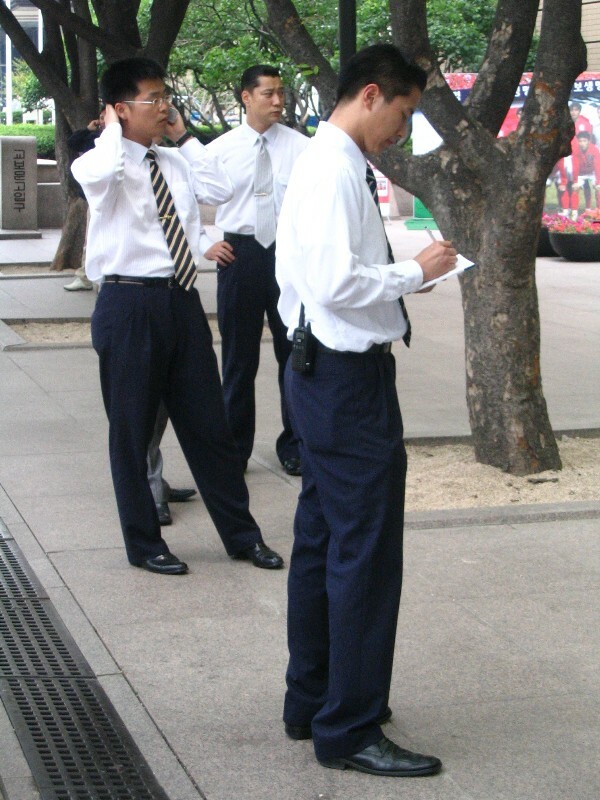 The friendly local plain clothes policemen were on hand. I want to add that, if passion were all that is needed to help the people of North Korea, Hannah Song (I believe she is the woman in the ball cap in the third picture) would be able to do it all by herself. Of course, it is not enough and I hope LiNK continues to grow so they can help get human rights on the front burner in international dealings with North Korea. Today is the 26th anniversary of the Gwangju revolt and massacre. During this week in 1980 hundreds or thousands of pro-democracy demonstrators and members of a "citizens' army" were killed by South Korean military forces. See this extensive post at the Marmot's Hole for more details. In Seoul, members of Liberty in North Korea (LiNK) commemorated hundreds of thousands or millions of North Koreans who have died and are dieing in North Korean gulags and preventable famine. May 22nd, 5:30pm - Koryo University: Kim Nyun Gwan So Theatre 418; Speakers: Tim Peters (Activist, Helping Hands Korea), Kang Chul Hwan (Defector, Co-Author of Aquariums of Pyongyang), and LiNK representatives. May 23rd, 5pm - Sogang University: K Gwan 203; Speakers: Tim Peters (Activist, Helping Hands Korea); Sohn Jung Hoon (Defector, brother was killed in a public execution in North Korea), and LiNK representatives. May 25th, 1pm - Seoul National University - Socheon Convention Hall Bldg. 140-1; Speakers: Tim Peters (Activist, Helping Hands Korea), Kim Sung Min (President of "Radio Free North Korea"), and LiNK representative. 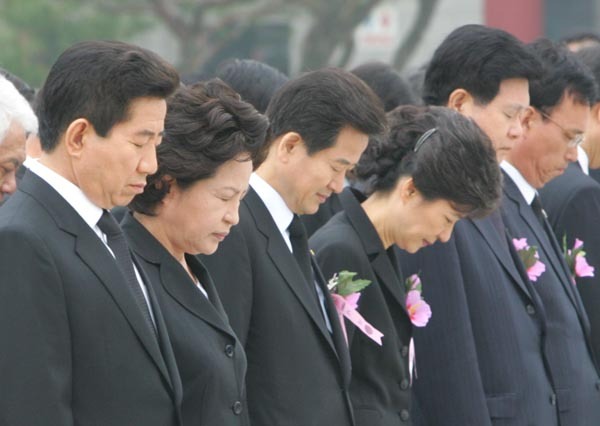 May 27th, 4:30 pm - Sookmyung Women's University: Centennial Hall 503; Speakers: Cho Myung Sook (Principal of Yuh Myung School/Jayoutuh School-helps North Korean refugees resettle in Sout Korea); Ahn Myung Chul (former North Korean prison guard), and LiNK representatives. Join us at these events, and many more to be announced! If you want to get involved, email them today. The Seoul Chapter of Liberty in North Korea is meeting this Saturday. It will be the last meeting before the start of Project Sunshine. If you ever wanted to get active on Korean human rights, this is the time. Will Park Kyung-seo get a pass at the NK human rights conference in Norway? Are things finally moving in the right direction on NK human rights? Not if Seoul can help it. I have always considered myself a pessimistic guy, but events do seem to be moving in the right direction on human rights for North Korea. The US is finally officially taking in North Korean Refugees (see the must read coverage at the Korea Liberator). 14.00: On Our Way – In Different Directions? Four Speeches. Session at Radisson SAS Hotel Norge, The Banquet Hall. EU's role in improving the human rights situation in North Korea. - Glyn Ford, MEP, Delegation for relations with the Korean Peninsula, UK. 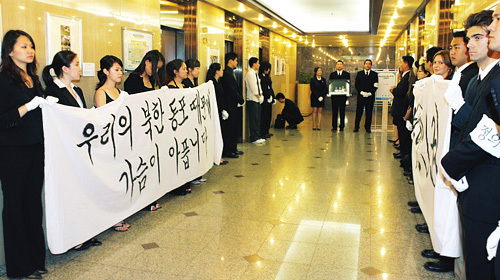 South Korea's role in improving the human rights situation in North Korea. - Kyung-seo Park, Ambassador at Large for Human Rights, Ministry of Foreign Affairs and Trade, ROK. - Marcus Noland, Senior Fellow, The Institute for International Economics, USA. North Korean Human Rights: The Sound of Silence. So we will have the Korean representative facing off against three white guys (going by their names)? Who thought of that? Maybe the pessimist in me is coming out again but didn't anyone at the conference think about how that might play back in Korea, the place that needs to be influenced on this issue more than anyplace else? I would have much preferred to have Park sharing a stage with representatives off NK defectors or at least South Korean critics of the Roh administration's policies on North Korea. Roh's supporters will use this event to try to frame the issue as outsiders who don't know about Korea taking a simplistic attitude about North Korean human rights and interfering in an inter-Korean issue. I hope that conference organizers realize this in time and put a dissenting Korean voice on that panel. I just sent an email to the conference organizers expressing my concern but I doubt that anything will come of it. If you are also concerned, you can also email them. Details are here. UPDATE: The meeting has been canceled to get ready for a big project they have coming up. Be sure to go to their next meeting on May 13. Are you in Korea and jealous of the folks in the States who can participate in North Korean Freedom Week? Well, now is your chance to do your part. Liberty in North Korea (LiNK) meet every Saturday afternoon in Itaewon. They are working on a bunch of stuff and could use your help. Their mission is so important that I will even forgive them for quoting Noam Chomsky in their announcement.